On one Saturday night of every second month, Vinyl Envy in downtown Victoria is the place is to be. The small record shop at 1717 Quadra street is home to many live concerts, and The Bad Mama Jama Show (BMJ) is one of the best. BMJ is a night for local musicians and stand-up comedians to showcase their talent. Although the structure stays the same, each show is different. Skye Allen, Quincy Thomas, and Daniel Belkin created the bimonthly event almost two years ago, under the creative collective Campfire Empire. 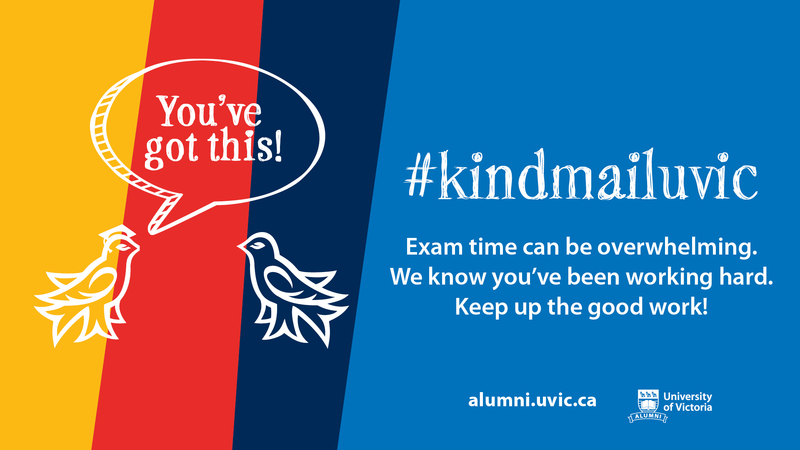 Thomas and Belkin are UVic alumni, and Belkin founded Vikes Improv, the UVic improvisational comedy group. Originally from Alberta and the Northwest Territories respectively, Allen and Thomas are two of Victoria’s many imports from other (colder) parts of Canada. When they arrived in their new home, they found a welcoming arts scene that inspired them to contribute. Soon after, BMJ was born. At the last BMJ show, the Miles Skye Club, one of Allen’s own bands, revved up a mesmerized crowd with freestyling rhymes and live-instrumentalized hip-hop. But if hip-hop’s not your thing, fear not — music genres can vary from one BMJ show to the next. At a previous show, musical group Rotten Apple Ruckus opened with an acoustic set, complete with bucket-bass, banjo, and washboard. The venue is intimate, so Ruckus’ steel-stringed twangs needed no amplification to get the crowd dancing. In case you’re wondering, Bad Mama Jama is named after a funk song by Carl Carlton from the 1980s, which is fitting since the show happens at a record shop. After everyone has shaken the dance moves out of their system, they are ready to take a seat to enjoy the stand-up comedy part of the show. Thomas, who organizes BMJ’s comedy portion, has been doing comedy in Victoria himself for more than three years, and in that time he has come to know the scene well. He books the show with seasoned comedians — usually members of Victoria’s open-mic beat — but makes a point of giving rookies a spot as well, always holding a lottery spot for a comedian that might drop in. You can trust that the BMJ is serving you a hand-picked selection of some of Victoria’s more well-established comedians, without being biased or repetitive. And that’s why Thomas feels that if you’ve never been to a comedy show before, the BMJ is a good place to start. If you want a professional, comedy club feel, you’d be better off going to Heckler’s, Victoria’s only dedicated comedy club. At BMJ there are no private tables with elegant pools of lamplight — you can get a seat next to the records if you’re lucky, stand in the aisles if you’re sprightly, or just find a spot to sit on the floor. But BMJ has features that other shows in town do not. The venue is informal, all-ages, and doesn’t have the distraction of alcohol. “The music, for one thing, is something that you’re not going to see [at other comedy clubs]. The vibe is something I haven’t experienced anywhere else,” says Thomas. In case you’re wondering, Bad Mama Jama is named after a funk song by Carl Carlton from the 1980s, which is fitting since the show happens at a record shop. You can browse for records while you’re there, and at each BMJ event, they give out raffle tickets to win a free record. Does it get any better than that? If you can’t make it to BMJ, below is a schedule of Victoria’s stand-up comedy beat. “If you want to you could see live comedy every night of the week in Victoria,” Thomas says. 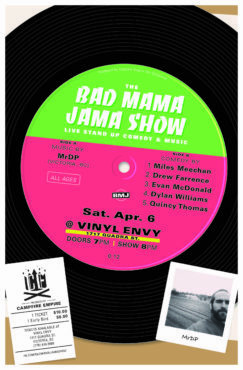 Bad Mama Jama will celebrate her second birthday at the next show on April 6. So get your shift covered or take a night off from studying, and go pay your respects. It’s a good idea to arrive early to all of these shows. Time: Doors at 7:30 p.m., show at 8 p.m. Location: 2620 Rock Bay Ave.
Time: Shows at 9 p.m. or 10 p.m.